George Downing, entrepreneur and founder of multi-million pound property company, Downing, has called on the city’s business community to put its money where its mouth is at a breakfast hosted by Spark Up, the Liverpool Chamber of Commerce’s new business accelerator programme. George said: “I’m always hearing how the Liverpool city region needs more businesses and business leaders constantly talk about a need to grow the market. Each of them, including myself, has a responsibility to invest and create jobs as well as support the growth of new business. George Downing has joined Spark Up as its entrepreneur in residence and will be working closely with the accelerator programme and its Bright Sparks, the name for the start-ups taking part in the programme. George has also personally invested a five-figure sum to the Spark Up prize fund while Downing has donated use of its premises on Old Hall Street to house the programme. Over the last 20 years George Downing’s property group has become one of the largest student accommodation providers in the UK. The group is currently delivering £290million worth of schemes including a phased development in Newcastle, the Central Village student accommodation scheme in Leeds, and four projects in Cambridge and Liverpool. Downing is also a major commercial landlord, with an office portfolio which includes The Port of Liverpool Building. George was speaking at the inaugural Spark Up breakfast event, hosted by chief executive of Liverpool Chamber of Commerce Jenny Stewart and attended by influential business and political figures including Mayor Joe Anderson. The 15 Bright Sparks which joined the pilot programme in March each delivered a sixty second pitch presenting their business objectives and needs. The panel of judges including George Downing, Mayor Joe Anderson, John Sutcliffe, chair of Liverpool Chamber of Commerce, and Paul Telfer, regional director of NatWest, awarded two of the start-ups seed funding to support with marketing, research, and product development. Russell & Brown Vintage Hair was awarded first prize of £1,500. The company specialises in retro and vintage styling for photo shoots, weddings, and television and film sets. A second prize of £1,000 was awarded to Andy Milne of Triketastic. Andy’s business will offer tourists and locals a new way of seeing the city in his reworked Volkswagon Beetle coupled to the back of a Harley Davidson. The yellow rickshaw-style vehicles will take customers on themed tours around Liverpool. 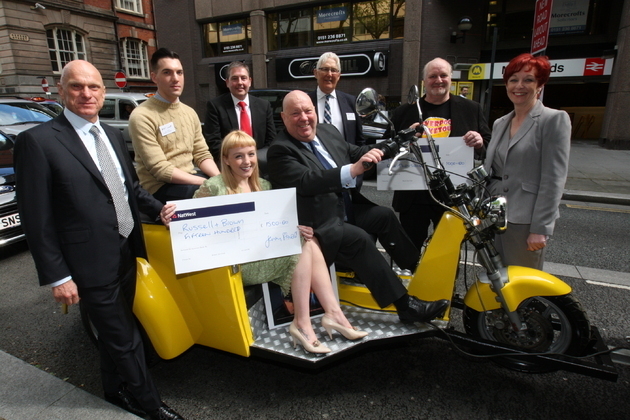 Taking part in the judging panel and hearing from the start-up businesses for the first time, Mayor Joe Anderson was so impressed by the quality, ambition and creativity displayed that he injected an extra £5,000 into the morning’s prize fund to be shared equally between the 15 entrepreneurs enlisted in Spark Up. Spark Up is supported by major private sector organisations including NatWest, national PR firm The BIG Partnership, and Liverpool University. The pilot programme, which commenced in March, has another three months to run before the bright spark businesses graduate at an event in July during the International Festival of Business.